Water causes numerous problems in basements, which is why TerraFirma provides a full line of quality basement drainage systems. All of our patented products provide an effective solution to your basement water problem. If you have issues with water in your basement in Seattle, Portland, Tacoma or nearby, call us today at 1-844-311-8051 or click below. We offer free estimates on all of our basement drainage work. 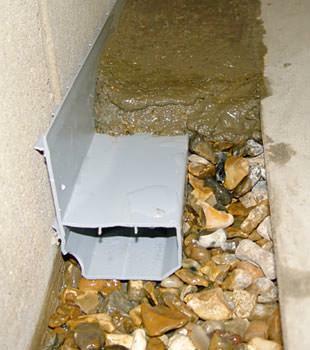 The WaterGuard® system is installed below the floor, which is then refinished over the top of the drain. 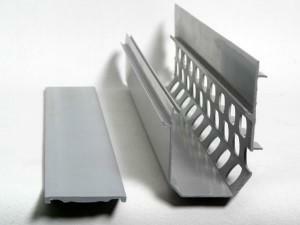 Includes wall flange with 3/8" opening to collect water from walls. There's no gap on the basement floor to let humidity into the space or to collect debris. Able to waterproof concrete block foundation walls. Weep holes are drilled at the bottom of the blocks to drain the hollow cavities. Will not clog with mud. The system sits on top of the footing, away from the "mud zone" underneath your floor. Water is collected without the risk of clogs that would halt your system. The WaterGuard® IOS system provides a large, easy to clean channel that prevents clogging due to iron ochre. In some rare cases, homeowners with high iron levels in their water will experience a thick, reddish-orange substance oozing through when the basement floods. This material is called "iron ochre", and it comes from both bacterial origins and from chemical reactions in the soil. It can easily clog your drainage system and stain your concrete, as well as anything else it touches. WaterGuard®: Iron Ochre System (IOS) is the answer for homeowners with iron ochre in their groundwater. This drain is specifically designed with wide openings and a completely removable lid that will help your system avoid clogging and provide clear access for maintenance. If you're tired of dealing with basement leaks or standing water in your basement, the basement waterproofing experts at TerraFirma can help. Our proven perimeter basement drainage systems will keep your home dry and ensure you have a clean, usable basement. Call us today at 1-844-311-8051 or contact us online for a free installation estimate in Seattle, Portland, Tacoma, Vancouver, Bellevue, Eugene, Renton, Hillsboro, Salem, Gresham and the nearby areas.